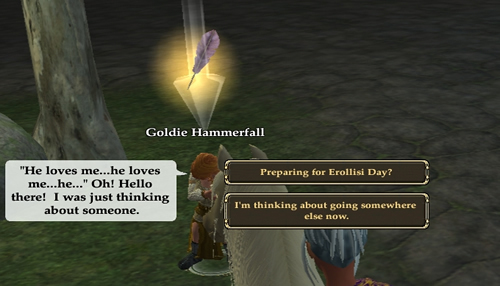 It's Valentines Day....er....or rather, "Erollisi Day" in Everquest 2! This month we got 2 events due to timing of the coming of the Kingdom of Skys Expansion, we also have another event to bring forth the new upcoming additional content and landmass. On the Qeynos side, you speak to a Halfling to begin the quest. On the Freeport side, you speak to a Troll. Who you speak to matters not, the quest is the same and so are the rewards to be fair to both sides. A little halfling stands broken hearted in front of the North Qeynos gates. Poor halfling, her love has fallen out of love with her and on Valentines Day! It seems she is working on making a love potion to try and get him back. Of course I must help her! She puts a spell on me that will alow me to find the ingredients she needs to make her potion. The effect is a beautifull colorfull array. A passion essence! I kept going along Antonica finding more. Along with passion essences, I also found lust and devotion. I scooped them all up as quick as I could and headed back to turn them into the Halfling Goldie Hammerfall. She was very happy to see me and rewarded me with "a lust candle" for my home! I can't wait to see what it looks like! But first I thought I would help her some more in hopes that I may get other kinds of candles because I would love to own the whole collection. I'm glad that I did the quest a few more times as it was a simple quest and I ended up with the entire candle colletion! These will look great once I finish decorating my new home.